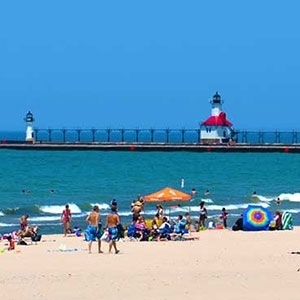 Overlooking the magnificent silver sand beaches of Lake Michigan, the cornerstone are of Michigan's Great Southwest is a departure from the ordinary at every turn. Diverse attractions offer new twists on the traditional: kayaking to wine tasking, cutting-edge industry to world-class golf, glassblowing to agritourism, there is truly something to amaze anyone. Outdoor recreation off the water is plentiful too. Golf, bike trails, disc golf, cross-country skiing, bird watching, kit flying, tennis and many other activities can be found throughout the area. Spectators can watch regattas and wind surfers from the bluffs around the lake. Walk ways through the parks and districts offer a variety of distances and sceneries. Southwest Michigan's soil and climate produces one of the richest harvests in the country and agriculture is the second largest industry in the state. Begonias, tart cherries, blueberries, pickling cucumbers, geraniums, petunias and squash are just some of the products that Michigan ranks first in the national production. Apples, dairy products, beef and wine are also produced for local, national and international export. Farmers markets and farm stores offer local access to food fresh from the fields and many stores and restaurants use local vendors. Winery tours offer not only wine, but during the summer season, many wineries offer entertainment events. Casinos, Music, live theater, sports bars, museums and boutique shopping offer additional venues to relax and unwind. Dining options are plentiful, from specialty cafes to fine dining, the eateries are almost unlimited to scope and variety. Unique culinary creations featuring local produce and regional flavors, home-made breads and desserts and friendly ambiance bring diners back again and again. Includes Cities/Towns: Benton Harbor, Saint Joseph. The young and young at heart will be thrilled with the Silver Beach Carousel, Curious Kids Museum and Whirlpool Compass Fountain in St. Joseph. Other family activity destinations are Celebration Cinema, Slackers Family Fun Center or Scooter Joe's Wheel & Water Rentals. Enjoy tees seen from the walking trails on the Harbor Shores Jack Nicklaus Golf Course, and the waterways of Michigan's Great Southwest are a panacea for the soul. Charter board fishing and Kayaking in St. Joseph or sailboat charters offer the best in water sports, romance or family fun. Beaches and swimming are always a hit in the summer, but the spectacular lake views and beach walks are a treat in any season. State, county and city parks provide ample opportunity to enjoy the natural beauty of the region. Art and creativity are on display through the area, from the nationally re-known Krasl Art Fair on the Bluff in St. Joseph, Water Street Glassworks in the Arts District of Benton Harbor, the Box Factory for the Arts in St. Joseph or the gallery at the Inn at Harbor Shores, art venues abound year round and saturate the open spaces. Jan 20.0 F° 27.0 F° 34.0 F° 2.0 "
Feb 22.0 F° 29.0 F° 36.0 F° 1.7 "
Mar 28.0 F° 37.5 F° 47.0 F° 2.1 "
Apr 38.0 F° 49.0 F° 60.0 F° 3.4 "
May 47.0 F° 58.5 F° 70.0 F° 3.6 "
Jun 57.0 F° 68.5 F° 80.0 F° 3.3 "
Jul 62.0 F° 72.5 F° 83.0 F° 3.4 "
Aug 60.0 F° 71.0 F° 82.0 F° 3.8 "
Sep 53.0 F° 64.0 F° 75.0 F° 4.0 "
Oct 43.0 F° 53.0 F° 63.0 F° 3.6 "
Nov 34.0 F° 42.0 F° 50.0 F° 3.4 "
Dec 24.0 F° 30.5 F° 37.0 F° 2.1 "
Spring temperatures are cold with averages in the upper 40's and highs in the upper 50's. Nights are cold with lows in the upper 30's. Summer temperatures are mild with averages in the low 70's and highs in the low 80's. Nights are cool with lows in the upper 50's. Fall temperatures are cool with averages in the low 50's and highs in the low 60's. Nights are cold with lows in the low 40's. Winter temperatures are cold with averages in the upper 20's and highs in the mid 30's. Nights are cold with lows in the low 20's.